Astronomers are using NASA's Hubble Space Telescope to dissect one of the largest structures in the universe as part of a quest to understand the violent lives of galaxies. Hubble is providing indirect evidence of unseen dark matter tugging on galaxies in the crowded, rough-and-tumble environment of a massive supercluster of hundreds of galaxies. Dark matter is an invisible form of matter that accounts for most of the universe's mass. Hubble's Advanced Camera for Surveys has mapped the invisible dark matter scaffolding of the supercluster Abell 901/902, as well as the detailed structure of individual galaxies embedded in it. The images are part of the Space Telescope Abell 901/902 Galaxy Evolution Survey (STAGES), which covers one of the largest patches of sky ever observed by the Hubble telescope. The area surveyed is so wide that it took 80 Hubble images to cover the entire STAGES field. The new work is led by Meghan Gray of the University of Nottingham in the United Kingdom and Catherine Heymans of the University of British Columbia in Vancouver, along with an international team of scientists. The Hubble study pinpointed four main areas in the supercluster where dark matter has pooled into dense clumps, totaling 100 trillion times the Sun's mass. These areas match the location of hundreds of old galaxies that have experienced a violent history in their passage from the outskirts of the supercluster into these dense regions. These galaxies make up four separate galaxy clusters. "Thanks to Hubble's Advanced Camera for Surveys, we are detecting for the first time the irregular clumps of dark matter in this supercluster," Heymans said. "We can even see an extension of the dark matter toward a very hot group of galaxies that are emitting X-rays as they fall into the densest cluster core." The dark matter map was constructed by measuring the distorted shapes of over 60,000 faraway galaxies. To reach Earth, the galaxies' light traveled through the dark matter that surrounds the supercluster galaxies and was bent by the massive gravitational field. Heymans used the observed, subtle distortion of the galaxies' shapes to reconstruct the dark matter distribution in the supercluster using a method called weak gravitational lensing. 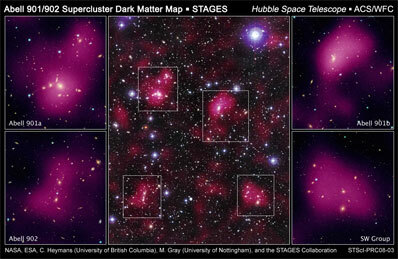 The dark matter map is 2.5 times sharper than a previous ground-based survey of the supercluster. "The new map of the underlying dark matter in the supercluster is one key piece of this puzzle," Gray explained. "At the same time we're looking in detail at the galaxies themselves." The survey's broader goal is to understand how galaxies are influenced by the environment in which they live. On Earth, the pace of quiet country life is vastly different from the hustle of the big city. In the same way, galaxies living lonely isolated lives look very different from those found in the most crowded regions of the universe, like a supercluster. "We've known for a long time that galaxies in crowded environments tend to be older, redder, and rounder than those in the field," Gray said. "Galaxies are continually drawn into larger and larger groups and clusters by the inevitable force of gravity as the universe evolves." In such busy environments galaxies are subject to a life of violence: high-speed collisions with other galaxies; the stripping away of gas, the fuel supply they use to form new stars; and distortion due to the strong gravitational pull of the underlying invisible dark matter. "Any or all of these effects may play a role in the transformation of galaxies, which is what we're trying to determine," Gray said. The STAGES survey's simultaneous focus on both the big picture and the details can be likened to studying a big city. "It's as if we're trying to learn everything we can about New York City and New Yorkers," Gray explained. "We're examining large-scale features, like mapping the roads, counting skyscrapers, monitoring traffic. At the same time we're also studying the residents to figure out how the lifestyles of people living downtown differ from those out in the suburbs. But in our case the city is a supercluster, the roads are dark matter, and the people are galaxies." Further results by other team members support this view. "In the STAGES supercluster we clearly see that transformations are happening in the outskirts of the supercluster, where galaxies are still moving relatively slowly and first feel the influence of the cluster environment," said Christian Wolf, an Advanced Research Fellow at the University of Oxford in the U.K.
Assistant professor Shardha Jogee and graduate student Amanda Heiderman, both of the University of Texas in Austin, concur. "We see more collisions between galaxies in the regions toward which the galaxies are flowing than in the centers of the clusters," Jogee said. "By the time they reach the center, they are moving too fast to collide and merge, but in the outskirts their pace is more leisurely, and they still have time to interact." The STAGES team also finds that the outer parts of the clusters are where star formation in the galaxies is slowly switching off and where the supermassive black holes at the hearts of the galaxies are most active. Added Heiderman: "The galaxies at the centers of the clusters may have been there for a long time and have probably finished their transformation. They are now old, round, red, and dead." The team plans more studies to understand how the supercluster environment is responsible for producing these changes. This work was supported by the Science and Technology Facilities Council (UK), NASA, the National Science Foundation Long Term Space Astrophysics (NASA LTSA) program, a Marie Curie Fellowship, a CITA National Fellowship, CIfAR, and CFI.